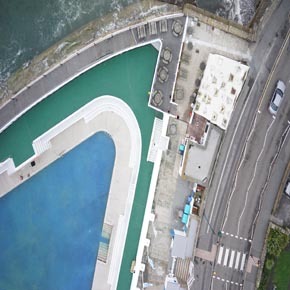 The Jubilee Pool, in Penzance, suffered serious structural damage during storms in 2014, which led to an effort from the community and local government to restore the cherished bathing spot. Being a saltwater pool, there was a high risk of corrosion to the concrete, so the project demanded specific design requirements. Therefore, the blue pigmented concrete used had to meet criteria whereby the durability for its intended design life was ensured. However, due to the soaring cost of the required blue pigment, Aggregate Industries worked closely with the main contractor, CORMAC Contracting, to propose a more cost-effective solution. Andrew Wilson, Territory Sales Manager at Aggregate Industries, said: “Jubilee Pool is an important fixture in the local community and has long been a focal point where people can gather and socialise, and families can enjoy a fun day out.